Grilling fruit is a great dessert option during the summer because of the slight caramelization which occurs in the fruit’s own natural sugars. Alice Currah of SavorySweetLife.com shares this recipe. See the full post at Kitchen Explorers. Oil the grate (grill) and heat on med-high. When the grill is nice and hot, grill each half peach for 4-5 minutes per side. Placed peaches on a plate with cut side facing up. Place a dollop of approximately 2 tablespoons of fresh ricotta cheese in the center of each peach half. For the Balsamic Brown Sugar Reduction: Cook the vinegar and brown sugar mixture on med-high heat until it is reduced by half, approximately 3 minutes. Remove from heat and allow to cool before proceeding. 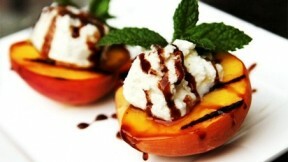 Drizzle balsamic vinegar over grilled peaches.